A few people have asked how I plan & track my EVE Online industry work. Rather than a video, I thought a write up with pictures up would easier. First, there is no one right way to do industry. Everyone is different and likes to see information in different ways. This is just what I do. I am “vertically integrated”, meaning I can take asteroid & moon ore and reprocess and react them all the way up to T2 construction components. This is quite profitable, but also time consuming and complex. If you are just starting to do industry, it’s probably not what you want to begin with. Most industrialist are simply looking for what components are needed to complete a build. So let’s pretend I get asked to build a Vargur. First, I look at my blueprints. Luckily, I have one already. Lucky I had one, they take a while to invent. I bring it up in the industry window. I don’t have everything I need. 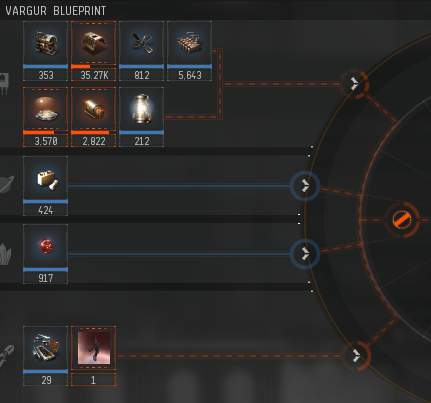 Building this ships uses up a lot of components. The interface has way to see what you are missing and copy that to clipboard, but don’t use that a lot. You can do a lot on this site. It’s wonderful. 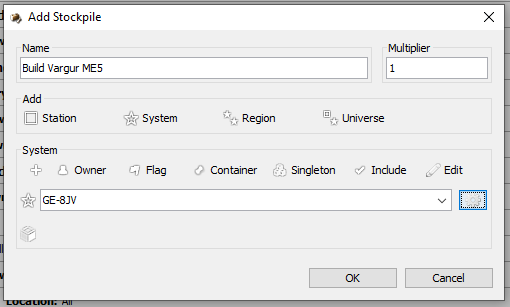 From the manufacturing page, I can set the construction variables. Here I set the structure type I will use for the build and the ME level of the blueprint. All of this allows a correct calculation of the materials needed for the build. You can see the Base Quantity vs Adjusted Quantity. This is the benefit of engineering structures and blueprints with material efficiency. 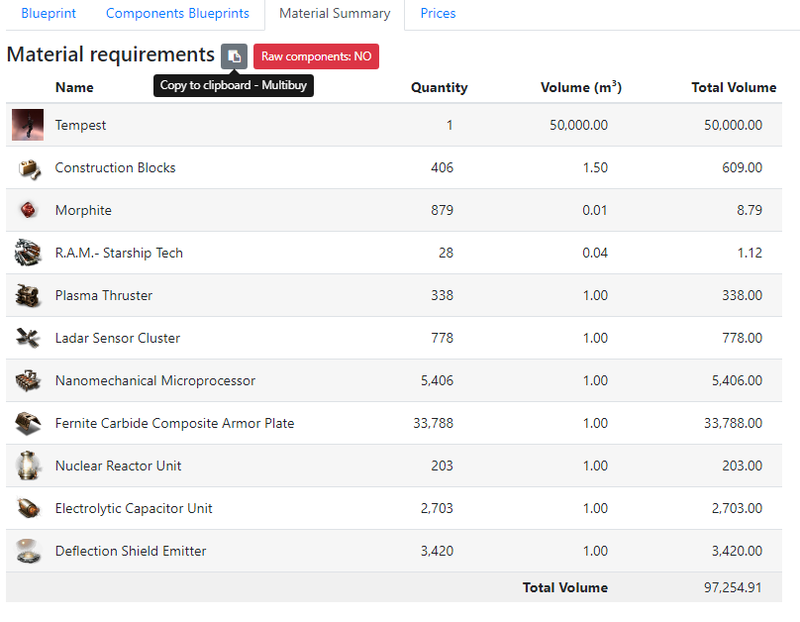 Once the info about the structure and BPC is entered, I look at the Material Summary tab. Here I can see the actual amount of materials needed to build the item. At the top is a button that copies the list to my clipboard. Next, I open jEveAssets. If you aren’t using jEveAssets, you should be. It’s an amazing program that does far more than list your assets. I find it invaluable. All hail GoldenGnu! Stockpile function is invaluable to me. First, I open the Stockpile tab. 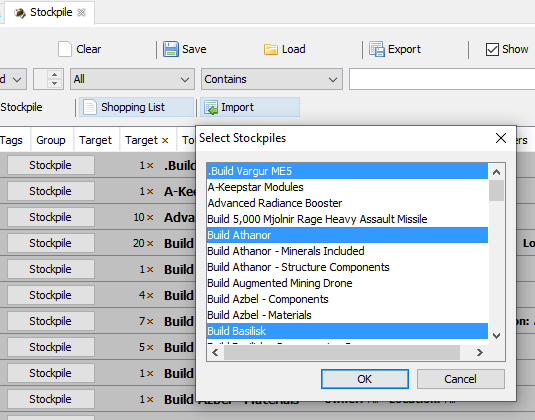 I use the Stockpiles function to check if I have the materials I need for a build. 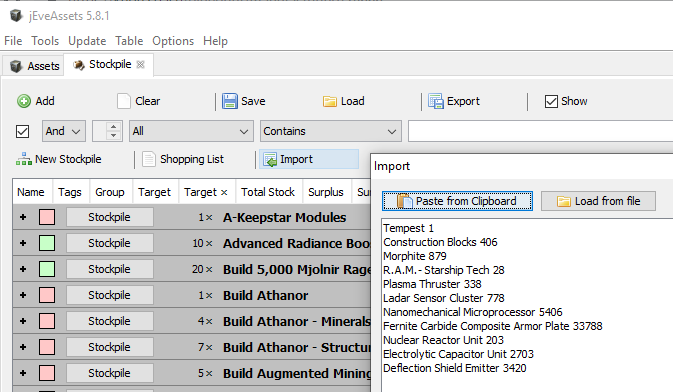 The materials needed are in my clipboard, so I use the Import function and Paste from Clipboard option. I select the ISK per Hour choice to parse the import. Not sure why that one works, but it does. jEveAssets asks for a name and what location to look at materials. 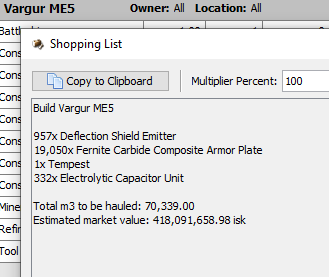 Here I’m naming it Build Vargur ME5, so I remember what it is in the future, and set it to look at my build system, GE-8JV only and ignore stuff I have elsewhere. You can adjust this to count at any combination of locations. Sometimes you want to check Jita or Amarr as well if you are buying stuff you need and want to do an overall count and check before hauling stuff. Now I can open the stockpile and see what I need. Since I keep a good stock of T2 construction parts I see I’m not in too bad a shape in terms of building materials. I need the base Tempest T1 battleship, a little bit more of Deflection Shield Emitter and Electrolytic Capacitor Unit, and a more significant amount of Fernite Carbide Composite Armor Plates. But I need to be exact to know what I need. Shopping Lists are the best! Happily jEveAssets make it very easy to know exactly what I need via the Shopping List. I love me some shopping lists. Now I have a copyable list of just what’s needed for the build. I can track this in Excel/Google sheets if it’s complex or simply put these components into build or buy them off the market. 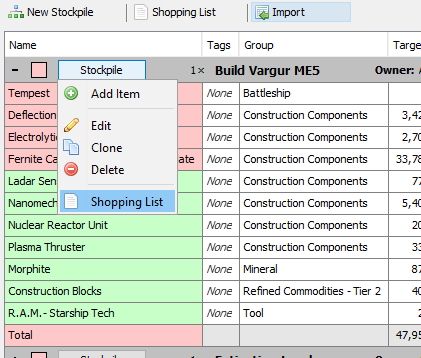 The Shopping List is even more powerful for building multiple things. Often I have multiple customers that want different things and I want a unified build/buy list. Here I pretend that I want to build a Vargur, an Athanor, and a Basilisk. 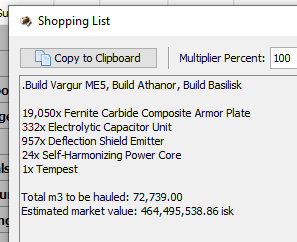 And here I get exactly what I need, a list of what I need including volume and rough ISK cost. Fantastic when you are building a lot of stuff. Lastly, I make sure to use a spreadsheet to track what I am building, for who, when they asked, and the state of the build. Sometimes I need to build the T1 versions first or can only build so many without more BPCs or other situations. It’s important to me to help write down where I am in the production process so I can remember what I was doing after a day of work or other RL activity. My example is with a Tech 2 ship, but the basic process works for anything you want to build. Even if you are making T1 items and need only the basic minerals, this method can provide you with a shopping list. Again, this is just my way of doing things. Others write complex Python scripts to do calculations. Some like to build larger comprehensive spreadsheets that do in one place what I am doing spread out between sites & applications. While I keep large stockpiles of materials, others practice “just in time” methods and only acquire the specific things they need for each build. The way that makes sense to you is the right way for you to do industry.